The Il Cannone celebrates Paganini’s legacy with what we believe to be a truly revolutionary sound. -on musicians that we can truly know for certain. And we would seem to have succeeded. with a good resistance to the bow. Noble and powerful. A biting tone with real punch. Highly colourful with many intricate harmonics. Clear. Open. Brilliant. A very fast and easy response especially in spicatto. 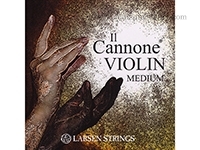 Il Cannone individual strings and sets are available as two versions. and powerful sound whilst the Soloist brings a fuller tone, with even more presence and focus. while the A, D and G strings build on a new, synthetic multi-filament core. and the D and G strings are wound with pure silver.